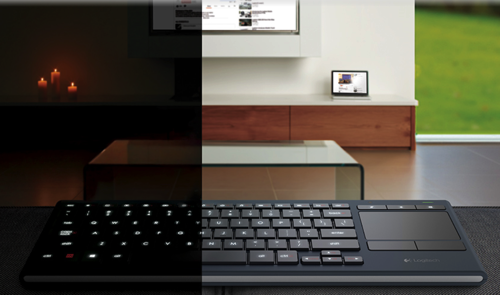 If you have a SmartTV or a computer connected to your media center the Logitech K830 Illuminated Living-Room Keyboard is for you. This keyboard/trackpad combination brings the two input methods together in a compact and easy-to-use package. Considering you get both a backlit illuminated keyboard AND a trackpad the $99.99 isn’t bad. Designed for Windows, it also works with Macs. Bringing a keyboard and trackpad together works well on laptops, so the idea of a keyboard/trackpad combination that can be used on its own makes perfect sense. And while the side-by-side design of the keyboard and trackpad takes some getting used to, after all, laptops have trackpads in front of the keyboard not to the side, after a bit of use the arrangement quickly becomes second nature. 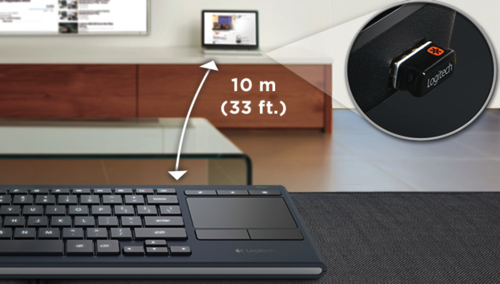 According to Logitech the K830 offers, “Effortless PC to TV navigation, even in the dark.” This is a cute description but one that is a bit too limiting and doesn’t fully capture the many uses a compact keyboard/trackpad combination like this offers. Still, let’s go with Logitech’s approach to describing the new Logitech K830 Illuminated Living-Room Keyboard, and then take a closer look at it from my perspective which, rather than focusing simply on the keyboard for use with a PC in the living room, appreciates the way it brings an excellent compact keyboard and functional trackpad together. Inside the box you get the K830 keyboard, a microUSB charging cable, a USB extender cable, and a small unifying dongle for connecting the keyboard to your computer. Worthy of the living room: Enjoy the perfect blend of function and form in your home. Minimal size doesn’t overwhelm the living room. Rounded sides and lightweight construction make it comfortable on the lap. Flat edges allow for vertical storage to save space. All-in-one wireless keyboard and mouse: There’s a time and a place for a mouse, we know, but it’s not your knee or the arm of your couch. 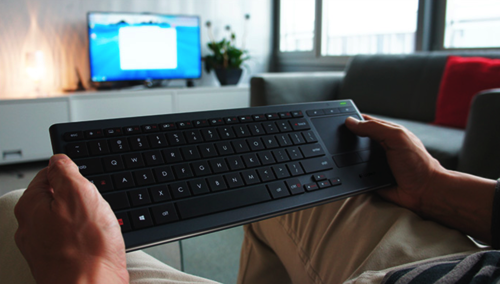 K830 streamlines navigation in the living room by combining a wireless keyboard and mouse into one device. Control the mouse pointer precisely and accurately from a distance with the built-in multi-touch touchpad. Since a keyboard designed for use with a media center will often be used in the dark — after all horror movies are always more impactful when the lights are out — Logitech made sure the keyboard offered excellent and effective backlighting. The backlighting comes on automatically when you start to type and, after 5 seconds of non-use, shuts off and puts you back into the dark… Just as Freddy reappears to claim yet another victim. To make things even more interesting, or to be more accurate — to make the case for this keyboard as an excellent way to control your PC-based living-room media center even more clearly –Logitech built in some great media shortcuts. These shortcuts let you “control your entertainment with a variety of one-touch function keys”. Sure, to make best used of the shortcuts you’ll have to spend some time learning about them, but the few minutes it will cost you are well worth the benefit that comes when these shortcuts let you do everything from control the media to launching the browser. F1 – Manual backlight settings. Cycle through: 0%, 50%, 100%. F2, F3, F4 – Minimize, maximize or close windows. F5 – Project screen on TV. Some may not like the fact that the media control functionality requires the use of keyboard combinations that include the F keys. They have a point, but the media control actually does work well. Of course the keyboard has rechargeable batteries inside. 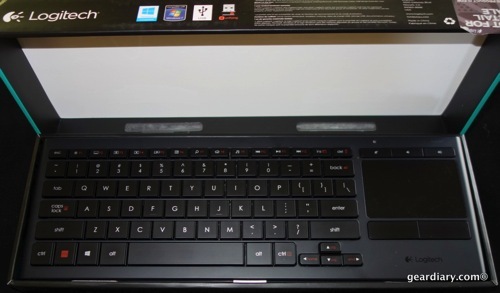 If you use the keyboard for 2 hours of typing a day with the backlight at full brightness, you will get up to 10 days of use after only 3 hours of charge. Less use and dimmer backlighting will, of course, give you more time per charge. And when the keyboard runs down, you can simply plug the included USB to microUSB cable into the computer and recharge it. In all, this keyboard/trackpad combination is designed to let you control your computer from the couch and enjoy your media on the big screen. The smart illumination of the keys and the built-in shortcuts go a long way toward making that possible. But what about connecting the Logitech K830 Illuminated Living-Room Keyboard to the computer? From everything thus far described here, one might conclude the K830 uses Bluetooth. After all, Bluetooth is pretty much ubiquitous on laptops these days. And if you guessed the K830 used Bluetooth you would be right — and wrong. The K830 does connect over Bluetooth, but for ease-of-use, immediate pairing, and solid connectivity the K830 has its own approach. You see, it The ships with a Logitech Unifying Receiver that comes pre-connected to the keyboard. 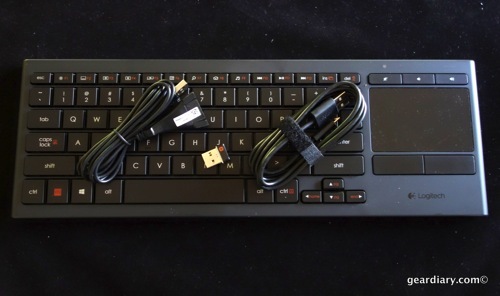 The small USB dongle plugs into a free USB port and automatically connects to the keyboard. The 2.4GHz wireless connectivity has a range of 33 feet and is rock solid. I’m not a fan of dongles, but the ease of connecting the keyboard to the computer and the solid connection are well worth the inconvenience of needing the dongle. And since this is a Unifying Receiver, you can connect up to six Logitech Unifying devices at a time. That means you can plug the dongle in, leave it in place and connect additional mice and keyboards to single computer. The biggest downside here is the fact that the “Unifying software” that lets you add multiple devices to one receiver is Windows only. Except for Microsoft’s and Apple’s own software, I really don’t understand companies putting out software that only works on one platform or the other; it is short-sighted and simply annoying. 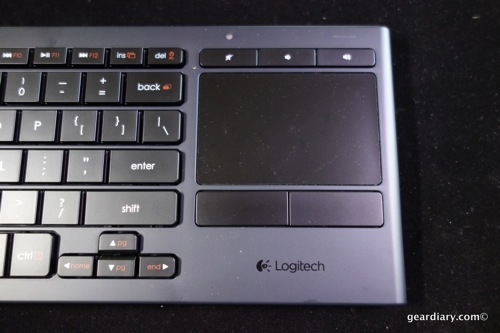 In summary, for Logitech the K830 is a keyboard/trackpad combination designed for use with a Windows PC connected to a media center. As such it works quite well. For me however, the K830 is something a bit different since it not only works well with my Samsung SmartTV but it also works with my Macs, and it offers a nicely compact keyboard/trackpad combination for on-the-go use. I purchased a 32″ Samsung SmartTV on Black Friday last year. It now hangs over my desk in my home study. The television has two USB ports on the side. I plugged the Unifying Receiver into one of them, launched the SmartTV functionality and, within seconds, the K830 was controlling the mouse cursor. I placed it over the search window, typed some text in and hit search. It worked perfectly, and it is a far better input system than the included remote. Is it worth $100? I’m not sure, but it certainly does streamline the process of using the SmartTV. The K830 works well with a Mac, as well. Here too, you simply plug in the Unifying Receiver and turn the keyboard on. It immediately connects and takes over the input functionality. Initially the trackpad was a bit slow, but a quick jump to the settings let me make some trackpad adjustments and, from there, it was all good. I am, in fact, typing this with the K830 right now. It is not perfect since the K830 is a bit noisier than my MacBook keyboard, but it works well and lets me get some distance form the laptop’s screen. The other downside is the fact that the K830 trackpad does not support the multitouch input that is so useful on Macs. It isn’t a huge deal, but if you do make serious use of multitouch you will be disappointed. 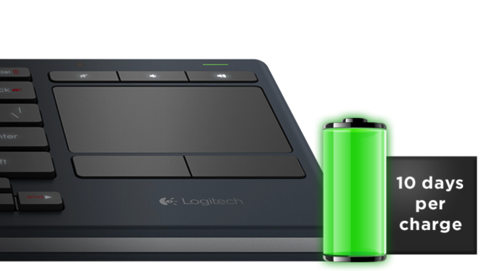 Finally, let’s look at the keyboard as a keyboard, and the trackpad as a trackpad. The keyboard is about the same size as the one on my MacBook Pro. The keys have more play than the MacBook’s but are quite comfortable for typing. As previously mentioned, they do make more noise than my laptop keys, but it certainly isn’t bad. In all the K830 falls short of my Mac’s keyboard, but it works fine. If this was the only keyboard available to me, I would be just fine; I can certainly see using this quite a bit when I am on the go, since it does remove the need for a separate mouse or trackpad. The trackpad on the K830 is … fine. Since it does not have multitouch, it falls short of the MacBook’s trackpad but is certainly functional. I would not want to use it as my only trackpad, but it certainly works in a pinch and, when combined with the K830’s keyboard, makes a nice combination. While writing this post however, I have found myself using the K830 keyboard but then reaching to use the Mac’s trackpad. That says something. 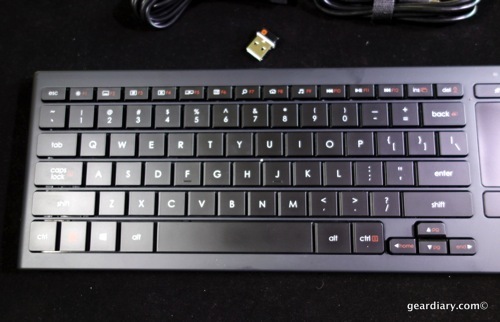 The Logitech K830 Illuminated Living-Room Keyboard is a good product overall, and it’s a very good product for specific applications. The keyboard itself is quite nice and offers a good typing experience. The trackpad is functional and, once my Windows 2-in-1 review sample arrives and I am able to customize the functionality, I suspect it will improve significantly. And while I would not run out and purchase either the keyboard OR the trackpad, the combination of the two is quite compelling. Considering the fact that the K830 works fully with PCs, holds its own with SmartTVs that accept external input devices, and it gets the job done with Macs, this combo-accessory is rather convenient. Is it worth $100? That depends upon your needs, but as a $100 accessory that brings a keyboard and a trackpad together the convenience alone makes it compelling. Learn more here. Buy it here through our Amazon Affiliate Store.